his journey from programming to becoming a marketer via web design. Jeff describes his journey to his work as an inbound marketer from way back when. He formed a web design company with a close friend in 2008. Their goal? Commitment to being the best. Eventually during his web design journey, he realized that other factors were entering into the internet, especially with regards to the generation of revenue. This included social media. Jeff began an in-depth study of buying behaviors and how that would work on the internet. He focused on HubSpot’s content. Eventually, HubSpot reached out to him and asked if he wanted to become a partner, and he did. Jeff contrasted this approach with traditional outbound marketing where mass mailings are performed or ads are broadcast on TV, radio, et cetera. 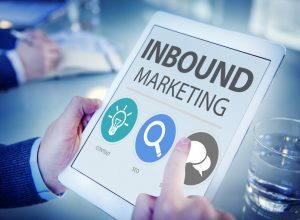 Jeff goes on to describe how with inbound marketing you position yourself to be found on a search engine, as users try to find solutions to problems that they experience. He talks about how this approach, inbound marketing, is also referred to as permission-based marketing, because the prospect has complete control of the conversation, and you as a provider only deepen your relationship based on gaining that permission. The way to do this is by being the authority and teaching rather than selling. The perspective customer first becomes AWARE that they have a problem, which they may or may not be able to define. So they proceed to go to the second stage, consideration. Then they do research to see what’s available to both define their problem and find a solution. Consequently, when this research is completed, the perspective customer is 75% through the decision-making process. This leads to the third and final step, decision-making. Jeff goes on to describe how HubSpot has changed the function of the sales person to now be more of a guide. The best way to be this guide is to create content, content that helps the perspective client define their problem as well as define a solution. This approach works well with Google’s current frame of mind, where Google is working to be more human. Google wants to provide content created by providers to help Google’s clients get the best results and the best solutions. The question is why would Google do this? The answer is this is how they’re able to show credibility with Google’s advertisers. Jeff goes on to describe the relationship between the pillar page and the content page. In the old days, searches were driven by keywords and really were context-independent and consequently could make a search difficult. Now Google reviews content based on intent as well as specifics in a piece of content. This allows Google to tailor searches for an individual user’s needs. The pillar page is basically a long document on your website that defines your intent, context within which you work, and the specific content that you provide. Links are made to specific content, creating a web of solutions that shows the site visitor both your authenticity and authenticity.